For most Star Wars fans, this week’s been a long time coming. The biggest news was the release of the Star Wars: The Force Awakens trailer. In 3 days, the trailer already had more than 30 million views, but that’s what this movie franchise is all about: setting records. 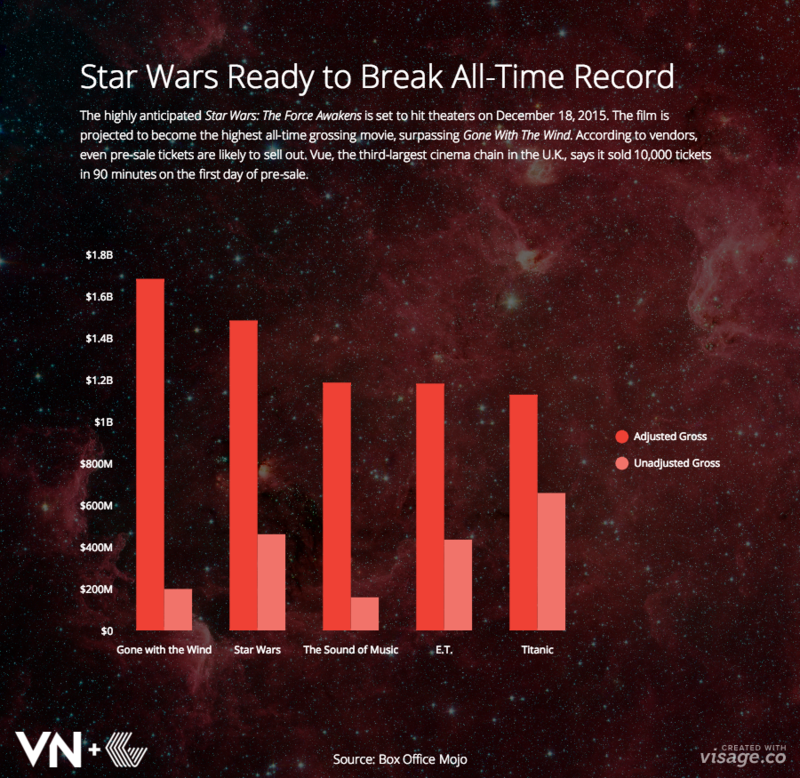 Although the Star Wars films are some of the most popular movies in cinematic history, Gone With The Wind still outranks Star Wars as the all-time highest-grossing movie. But that’s all about to change. The new Star Wars movie is closing in quickly on the Confederate front-runner. The chart below looks at the top 5 highest-grossing movies, taking into account ticket price inflation. Prices are adjusted to the estimated 2015 average ticket price of $8.34. Inflation adjustment is mostly done by multiplying estimated admissions by the latest average ticket price. Where admissions are unavailable, adjustment is based on the average ticket price for when each movie was released (taking into account re-releases, where applicable).